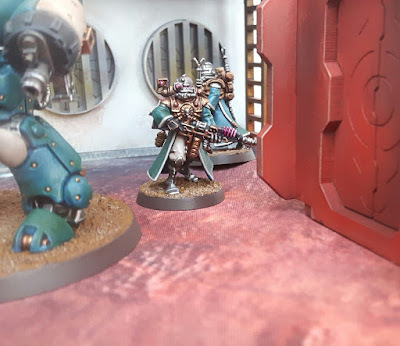 It doesn't seem so long ago that I was celebrating the completion of a 500 point force of Skitarii/Adeptus Mechanicus. This weekend I broke out some terrain to take a few celebratory photos of a completed 1000 point force! The army in all their glory! Now, 1000 points might seem like a small force by some people's standards but, for me, it's an excellent milestone. 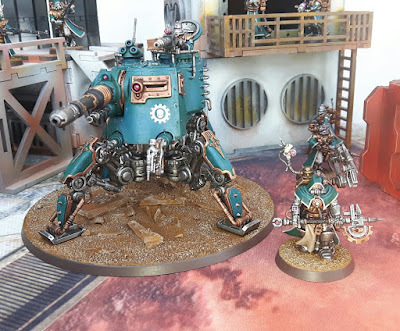 I haven't been collecting Mechanicus for that long (again, by my own standards) and to have a well rounded army painted to a good level is something that I'm very proud of. Originally, they were conceived as a Skitarii only force. Mostly because I prefer the Skitarii models over the Mechanicus ones and, at the time, they were split into two codexes. 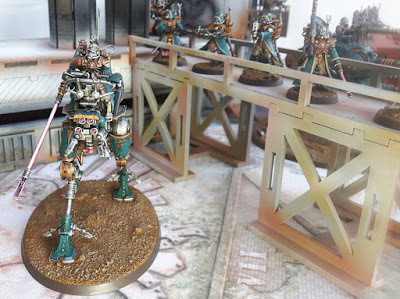 A slight problem came in the form of the Start Collecting Skitarii set as it includes a Magos Dominus who used to be part of the Mechanicus faction. 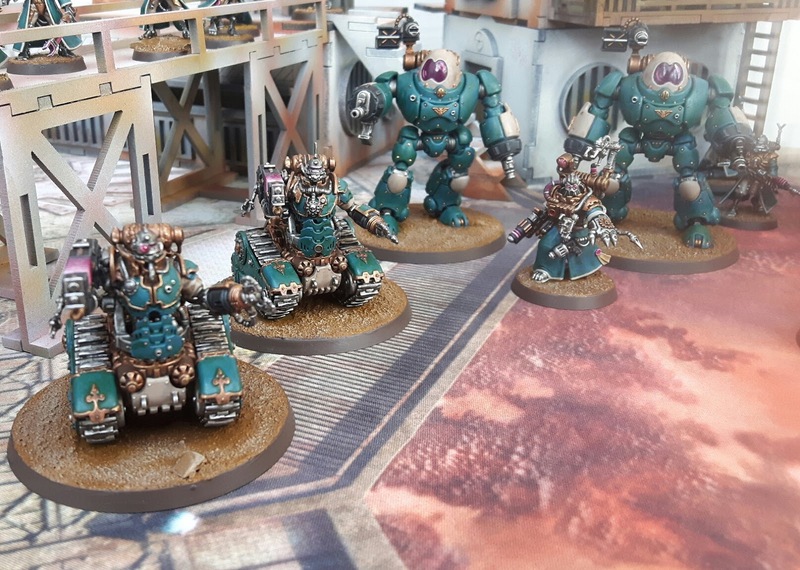 This was complicated further when my darling wife kindly bought me a set of Kastelan Robots for Father's day, not realizing that they were technically a separate faction. This led to them becoming a bit of a combined arms force long before the advent of the current codex, where the two forces have been combined into one list (as they always should have been). 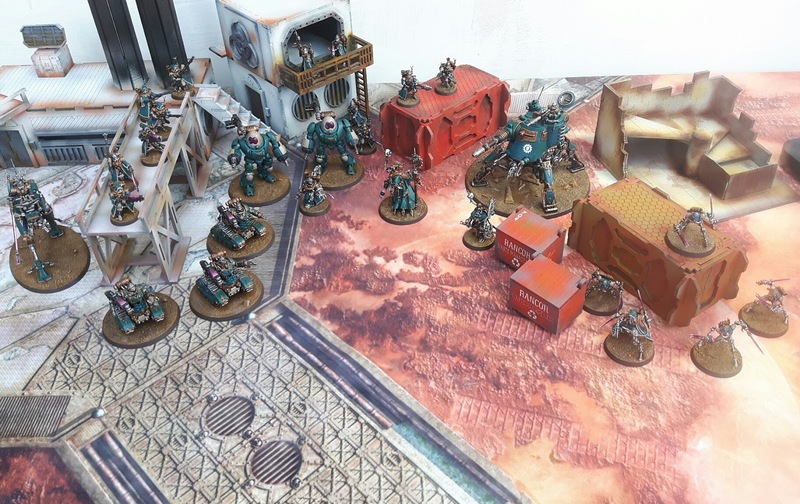 The army, as it stands is still mostly Skitarii. With the Kataphron Servitors and the Kastelans making up the Mechanicus contingent. The balance will change further still as the next unit to be added will be another unit of Kataphron Servitors that I am painting up for Squaduary. Onager with magnetized Neutron Laser. The force has benefitted hugely from various online painting challenges. The Onager pictured above was painted for Dreadtober whilst a squad of Skitarii Vanguard was completed for Squaduary 2017 with the Kastelan robots added shortly after for Monster March. The rest of the force has come together in dribs and drabs; but pushing myself to turn out a completed unit instead of three or four models has really helped. The final factor in making this army happen is the builder campaign that was organized by my buddy Lewis. He runs a blog over at Canis Aureus showcasing his own work. But I owe him huge thanks for all the work he put in which really pushed me along to hit those points quotas as the campaign escalated. I'll leave you with a few more photos of the models, but I'm delighted with the army and can't wait to see how they will grow in the coming year. A Dragoon advances covered by a Ranger squad. Ruststalkers appear out of the dunes. Very nice! Also what is your terrain? Is it mostly mdf or is there scratchbuild in there? Nearly all of the terrain is from TT Combat. The ruined building in the group shot is made by Warbases. Gotta love a bit of mdf! Your models are amazingly painted! well done! it really gives something to aspire toward! Thanks mate! I try my best but I still have a long way to go. Vehicles are the tough part for me but I'm gradually improving. I remember that terrain! 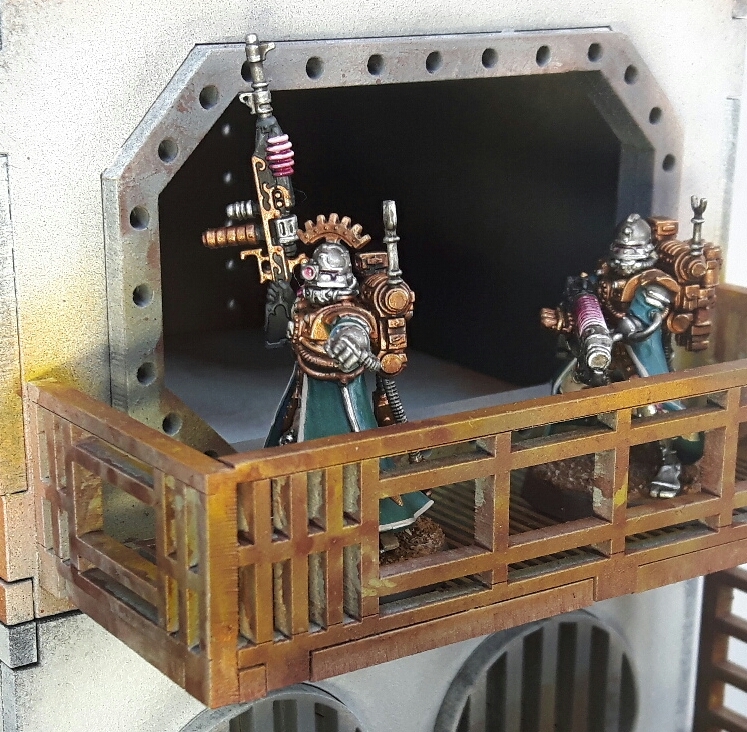 The models are looking great too. Congratulations on the finished 1000 points, it's rare to get anything completed to that quality and quantity. Thanks dude. Here's hoping it will reach the 2000 point mark. Also, thanks for painting the terrain, the army wouldn't look half so good without it. Cheers Cylde. You will have to thank Blazmo for the terrain, he generously painted it for me.